A proud ex-Camberwell High School student (1953–1957), Dot Browne (née Green) loved her time at the school. She says, “I gained tremendous self-esteem and confidence through being given lots of responsibility in the five years I attended Camberwell High”. Dot was Form Captain each year she attended CHS, Junior House Captain in Year 8, House Captain of Roosevelt in Year 11 and probationary Prefect at the end of Year 11 before she left. As a young married mother of four, Dot completed her HSC at Box Hill night school classes and then went on to gain her primary teaching diploma and later, at Monash, an Arts degree. Since this time, Dot has taught at primary school in the eastern suburbs, predominantly as an art/craft teacher. For several years, she has dropped back to part-time teaching and then retired completely in 2009. As a retired art-teacher, she now has time to do her own art and loves doing mosaics for exhibitions and is Treasurer of the local Whitehorse Arts Association. Dot had taken part in athletics at school and was a champion while at CHS, then later played a range of sports when her children were young. However, it wasn’t until Dot turned 38 and joined the Victorian Veterans’ Athletic Club (as it was then known), for people over 35 years of age, that she discovered she was a good distance runner. 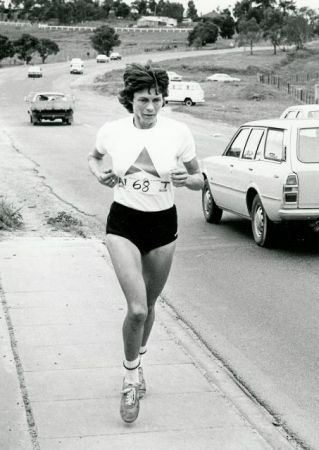 She took part in some 10km races and Fun Runs and her first marathon was in the Melbourne Marathon in 1979, clocking up 3 hours and 35 minutes. After taking on a running coach in 1980, Dot improved her marathon times dramatically and represented Australia in marathon teams all over the world (while still teaching full-time and raising children!). Her best marathon time was achieved in the London Marathon in 1983 with a time of 2 hours and 41 minutes. 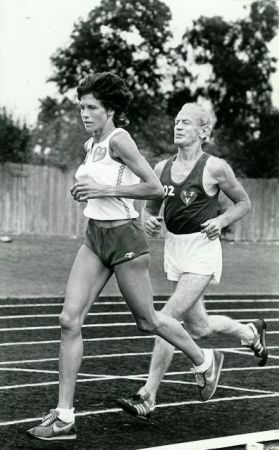 Dot then went on to compete in many running events, from 800m through to marathons. Eight of the records she set between 1980 and 1986 still stand today, for events ranging from 1500m (W40) to marathons (W40). Editing various running magazines and newspapers, such as Fun Runner (1981–1992), The Veteran Athlete (1985–1989) and Ultra Mag (1986–2001). Representing Australia as a marathon runner in international marathons in London, Auckland, San Francisco, Singapore and Jakarta as well as many interstate Australian events. Dot reports: “I unbelievably fortunate with everything that has happened in my life. I loved my school years, I have had great sporting success, I was satisfied to get some academic success and I am still very happily married to my lovely husband, Col, after 51 years”. She turned 71 in 2012 and has turned her interests from athletics to a weekly bike riding group.